Bees can swarm anywhere. But when they do, they're not aggressive; just looking for a new home. If you have a swarm of bees in a tree near you, attached to your house or structure, or even inside your house or structure, that means that the bees are healthy and productive, and doing what they're supposed to. Don't worry! At this stage they're docile and not aggressive. Swarming is the process by which a new honey bee colony is formed when the queen bee leaves the colony with a large group of worker bees. Swarming is the natural means of reproduction of honey bee colonies. 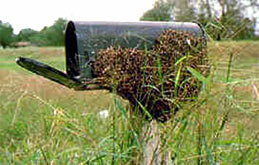 While bees are swarming they are very docile and are just looking for a new home. They have filled up on honey for their journey. By doing so, it's much harder for them to sting you because they can't extend their stingers. They may gather in a tree or on a branch or somewhere that's not convenient for you. There, they cluster around the queen and send 20 - 50 scout bees out to find suitable new nest locations. If you leave them alone, they'll eventually find a home and depart. But we'd prefer you let us know where they are so we can come offer them a new home. Swarming bees are happy, strong bees. That's why it's important for us to give them a new home, so that they can eventually pass on those healthy genetics to our other bee friends. If you need a swarm removed, please contact us below with as many details as possible. For simple removal, there's no fee. We love free bees. If a cut-out is required, a fee may be required based on the situation and scope of work. Bee Found offers live bee removals for St. Louis metropolitan and surrounding areas. We will carefully remove your bee swarm or established bee colony and relocate it so that the bees can lead happy, healthful lives in a new space where they aren’t a nuisance to anyone. We never use pesticides or poisons. We only offer humane bee removal. Our policy is, if you receive a quote from a pest control company who will exterminate the bees for less, we will match their price and save the bees! Plus, you may even get some honey out of the deal! For immediate help, please fill out the form below and we’ll get in touch with you in less than 24 hours.